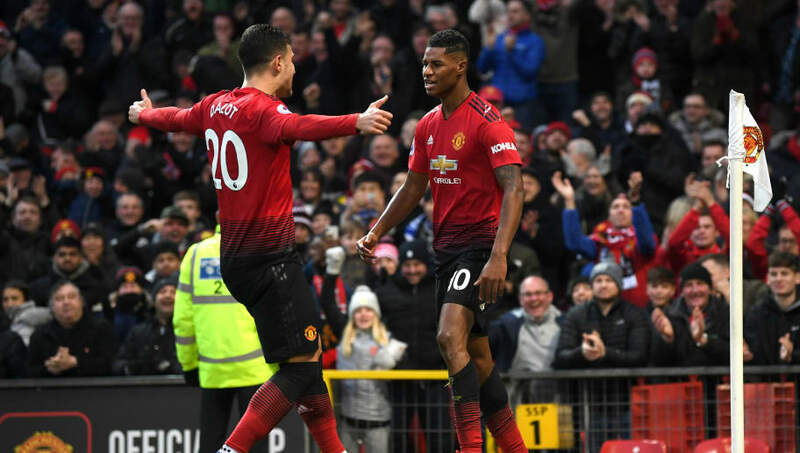 Manchester United made it seven wins from seven games under Ole Gunnar Solskjaer on Saturday afternoon as they brushed off a spirited Brighton to win 2-1 at Old Trafford. The Red Devils were given the opportunity to take the lead halfway through the first half by referee Paul Tierney, after he adjudged Gaetan Bong's barge on United's number six Paul Pogba worthy of a spot kick. ​Pogba's splendid first touch from a long ball caught the Cameroonian full back on the back foot, leading to the Brighton defender bringing the ​United man crashing to the turf. The Frenchman cooly converted the spot kick. The Seagulls responded positively to falling behind, with veteran striker Glenn Murray lacking the composure to finish off two good opportunities to potentially level the scoreline before United doubled their lead just before half time through ​Marcus Rashford. The 21-year-old found an angle for a shot after a terrific piece of skill on the left hand side of the area before curling a powerful effort across David Button and into the top corner. Brighton pulled one back against the run of play just after the 70 minute mark when a terrific outside of the boot cross from Davy Propper found the feet of German Pascal Gross, whose poked effort with his right boot found the net courtesy of the underside of the bar. Despite some late pressure from the Seagulls, United managed to hold on to secure Solskjaer's perfect start to his United reign. Ole Gunnar Solskjaer's job interview for the permanent job in the Old Trafford dugout is still without a hitch after this latest win. The Norwegian's brilliant start at Old Trafford has now put the Red Devils in touching distance of the top four, something which looked impossible when Jose Mourinho departed the club. Their current red hot form makes it hard to write them off. Not the prettiest display from Manchester United but a very important three points. Keeps the pressure on the top four rivals. Seven wins from seven for Solskjær. Happy days! Starting XI: De Gea (7), Young (6), Jones (6), Lindelof (6), Dalot (6); Herrera (7), Matic (7), Pogba (8); Lingard (7), Rashford (9) Martial (8). Substitutes: Mata (6), Lukaku (6). STAR MAN - Marcus Rashford's goal was an individual piece of magic. Based on his recent performances, it is clear to see why he keeps getting the nod from Solskjaer to lead the United line. He is not just a clinical pacy striker, but also an attacker of unbelievable flair, energy and determination, who never stops looking for chances to create and devastate. The 26-year-old lacked the cutting edge and killer instinct of Martial and Rashford, which saw him substituted for Juan Mata halfway through the second half. Chris Hughton will be happy with his side's fighting spirit and how dangerous they looked on the counter attack during periods of the first half. He will be disappointed however with the penalty as his side were looking threatening in the minutes beforehand. The game could have been so different if his side had been more clinical and not conceded in such a gifting manner. Starting XI: Button (6); Montoya (5), Dunk (5), Duffy (6), Bong (4); March (6), Gross (6), Stephens (6), Propper (7), Locadia (6); Murray (6). Substitutes: Andone (5), Knockaert (5) Kayal (5). STAR MAN - Midfielder Davy Propper was crucial in Brighton's best moment of the game, with his classy cross converted by Gross in the second half. The Netherlands international looked good in possession, helping Brighton create plenty of opportunities to open the scoring in the first half. WORST PLAYER - Gaetan Bong struggled to contain United's rampant attackers. The 30-year-old full back was at fault for United's opening goal after clumsily bundling over Paul Pogba and did relatively little to make up for his mistake in the remainder of the game. Both clubs will resume their respective FA Cup campaigns next weekend, with United facing Arsenal at the Emirate in what looks to be one of the matches of the fourth round. Brighton on the other hand, will play at home to Championship side ​West Brom at the Amex Stadium, hoping to progress to the fifth round and avoid an upset against Darren Moore's promotion chasing Baggies.